Knee replacement problems are usually fairly minor and short lived, with approximately 90% of knee replacements being extremely successful. Unfortunately, problems do occasionally develop. All surgery carries risks and in the early days following a knee replacement, things can feel uncomfortable. The best way to ensure you make a great recovery after a knee replacement is to do knee replacement exercises both before and after surgery until you have regained full movement, strength and function in your new knee. Here we will look at the most common total knee replacement problems people experience in both the short term and long term, the risks associated with having surgery and how to tell if something is really wrong. 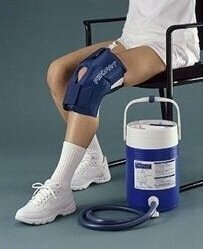 Alternatively, visit the partial knee replacement problems section. Once the anaesthesia has worn off, the knee may feel sore as a result of the surgery both inside the knee and around the scar. It is really important to be having effective pain relief to keep this under control. Don't try and manage without medication too quickly. It is much better to take prescribed medication to keep the pain under control so you can start you rehab exercises and get up and about. People often find the very quickly the knee feels much better and actually less painful than before the operation as you no longer have the arthritis pain and the knee is able to move more freely. Another common knee replacement problem people sometimes find is that it may also feel a bit numb around their scar – this can happen because some of the small nerves that supply feeling to the skin are cut during the operation. Nerves can take up to two years to fully heal so you may notice improvement up until then. Any resultant numbness after that time is not likely to change. Swelling is one of the most common knee replacement problems. There is usually swelling around the knee for the first few days after surgery. The knee is initially bandaged to help reduce this. Once the bandage is removed, tubigrip compression bandages can be used to help reduce the swelling and support the knee. Keeping the leg elevated when you are lying down or sitting helps the excess fluid drain away from the knee and reduce swelling. Another thing that can help is using ice therapy. When used properly, this helps to slow the blood flow and any bleeding in the joint, reducing swelling. There are a number of different ways to apply ice. Cryo cuffs are often used in hospitals and once you get home you can use an ice pack - find out more in the ice wraps section. Movement and exercise is another great way to reduce swelling as it pumps the fluid out of the joint. However, you have to get the right balance. If you try and do too much too soon, you can actually make the swelling worse. Follow the guidance of your physical therapist. Sometimes people find that their knee makes funny creaking/cracking/ popping noises after a knee replacement. This is nothing to worry about and usually settles down within a few months as everything heals. Some people struggle with stiffness in their knee, particularly if their movement was affected before the operation. Working on your rehab programme is one of the best ways to avoid this. 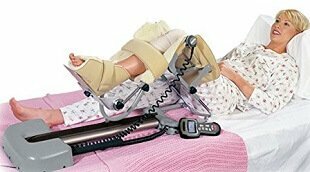 Some surgeons like their patients to use a CPM machine (continuous passive motion) initially after a knee replacement. This automatically bends your knee up and down. The amount of movement can be adjusted to gradually increase how much the knee bends. If stiffness continues to be a problem long term, your doctor may want to do a manipulation under anaesthetic (MUA) where they put you to sleep and bend your knee to break down any scar tissue or adhesions that have formed. With any surgery, there are risks. These include bleeding and infection. Risks for anaesthesia include breathing problems and reactions to the medications. 2) Infection: usually at the site but the infection can spread around your body. How Do I Know If Something's Wrong? Whilst serious knee replacement problems are rare they can be serious. You will know if something is seriously wrong as the knee will become very painful, it may swell and you may notice redness around the knee joint. Occasionally this may be accompanied by a fever. If this happens talk to your doctor immediately.